When my copy of Unique Cars turns up, the way I tackle reading it depends on my mood; it’s a toss-up whether I turn first to the Esteemed Ed’s existential ruminations for spiritual guidance, or Stonie’s cartoon for a belly laugh, or the private ads looking for an affordable gem I might want to swoop on (good luck with that, Rob). More often than not, though, I turn to the Melbourne Bloke Centre pages to see what mischief Morley’s been up to. Brian Tonkin’s letter to Morley in last month’s issue pressed my buttons. You may remember that Brian’s trusty EJ (before anyone asks – with regular grey motor) for complex reasons ended up dangling all four wheels in the air while being supported amidships on a heap of dirt (it could happen to anyone…). Brian then suffered for his art by climbing out the window because the doors were jammed shut. The Holden’s monocoque body wasn’t taking kindly to supporting all of its weight in an area its designers hadn’t intended – under the centre of the floorpan. With an energetic bout of shovelling Brian removed enough of the offending mound to get the quartet of old G8 Goodyears back on terra firma to take up the load. Hey presto – the door gaps returned to normal and everything opened and closed properly once more. It was a case study that could be used in the classroom to illustrate that not only is steel a flexible material, it is also elastic, enabling it, within prescribed limits, to flex then resume its original shape when the distorting force is removed. It illustrated these properties under static loading. I can confirm that creative driving can demonstrate the same outcomes using dynamic loading. 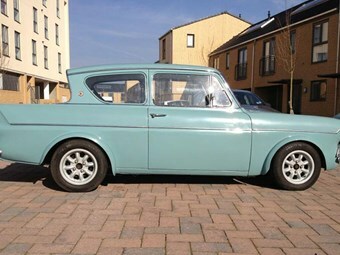 Back in the 60s when a thoughtfully modified 105E Ford Anglia (yes, the Harry Potter model) was pretty hard to beat in a spirited drive through the twisties, I was in the death-seat in one being driven expertly by my good mate. It was about 2.00am, on a winding, rising and falling, remote dirt road on Victoria’s Mornington Peninsula. We were going for it, as you do, flicking between second and third, getting air over crests, bottoming out in dips, and throwing rooster tails from the rear Dunlop SP44s through opposite-lock bends, clearly nailing an imaginary stage in our imaginary rally. Suddenly we were flying… There was no sharp bend. Just a sheer drop. Like 1.5 metres (five foot) straight down! With its front-mounted engine and two solid blokes strapped in up front, the light little car nose-dived, landing vertically before skidding for 10 or 15 metres on its front bumper, deciding whether to tumble forward on to its roof or fall back. We got our preferred outcome – it crashed back onto its wheels. Apart from one strut getting punched part way through its tower and the sump-bottom and oil-pickup being bashed up two or three centimetres, the body was straight as a die. However all six stainless clip-on body-mouldings had been jettisoned from the quarter-panels and doors. The five we found before our torch died clipped back in place perfectly. Another useful case-study, this time demonstrating that the nose-dive impact had momentarily shortened and ballooned the Anglia’s monocoque body, thus ejecting the non-impacted mouldings from their clips. Post impact the body recovered elastically, resuming its original dimensions and shape, ready to have the mouldings re-fitted. As we used to write at the conclusion of a physics experiment report: QED. It seemed odd, though, having to pull clumps of weeds from the gap between the top of the Anglia’s badly bruised bumper and the radiator grille.